Immigrationresource.net is an online immigration news and resources on U.S. immigration law, procedures, policies and strategies, serving communities in the United States and abroad. Immigrationresource.net is written by immigration attorney or lawyer, and immigration professionals. Our authors have years of professional immigration work experience, through representing, handling and/or interacting directly with diverse communities, immigration issues and cases. With a combined multiple decades of professional immigration experiences, we are your best source of immigration news services, updates and resources. Immigrationresource.net is managed by Aik Wan Kok, Immigration Lawyer or Immigration Attorney at Tiya USA Immigration Services, focusing on U.S. Immigration & Nationality Law. Immigrationresource.net is intended for informational purposes only, and should not be relied on as legal advice or an attorney-client relationship. 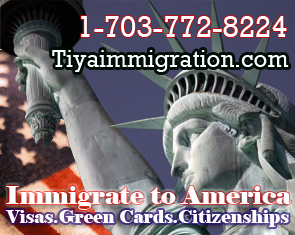 For further information, please contact: Tiya USA Immigration Services for Immigrationresource.net, 1629 K ST NW, STE 300, Washington DC 20006. Telephone: 703-772-8224; Telephone: 202-642-4902; tiyalawyer at gmail dot com. © 2010 Immigration resource news magazine for United states of america All rights reserved.